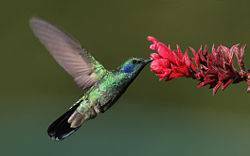 In this page, we will look at the amazing Humming Birds. Besides being able to hover in place, the hummingbird can also fly backwards. It is the only bird able to do so. Hummingbirds are small birds with long, thin bills and extendible, grooved tongues. These features allow it to feed on nectar deep within flowers. 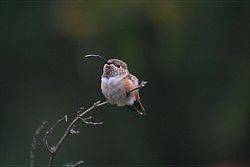 Hummingbirds will also prey on insects for extra nutrients. The Bee Hummingbird is the smallest bird in the world, weighing 1.8 g (0.06 oz) and measuring about 5 cm (2 in). A typical North American hummingbird, such as the Rufous Hummingbird, weighs approximately 3 g (0.106 ounces) and has a length of 10–12 cm (3.5–4 inches). The largest hummingbird is the Giant Hummingbird, which can weigh as much as 24 g (0.85 oz) and measuring 21.5 cm (8.5 in). A hummingbird feeding from a flower. A hummingbird’s heart can beat over a thousand times a minute while the bird is in flight. To provide enough energy for the rapid beating of its wings, a hummingbird must eat up to five times their own body weight in nectar each day. At any given moment, a hummingbird is only hours away from starving. Fortunately, hummingbirds are able to conserve energy when they are not looking for food by entering a hibernation-like state called torpor. A hummingbird with its tongue sticking out. Below is a video of a hummingbird eating from an artificial feeder (and flying backwards).